spend, manage and invest money! L&N is proud to be a partner in your child’s financial education by offering the Coindexter Club completely FREE of charge for children age 12 and under. 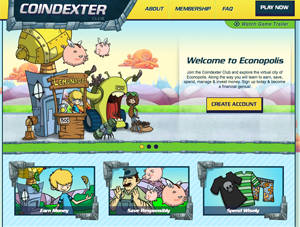 The primary feature of the club is the virtual city of Econopolis found at Coindexter.com. Econopolis is a fun and engaging game-based virtual world that immerses children in real-life learning situations. Children assume responsibility for chores and jobs, run their own company, and manage their virtual earnings. 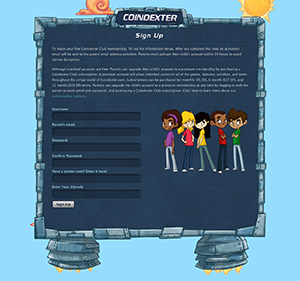 The Coindexter Club is designed to contribute to your child’s understanding of the responsibility and knowledge required to manage money effectively, spend wisely, and save aggressively. In addition to emphasizing money management, the club also focuses on helping your child be a contributing member of your household by encouraging responsible behavior, accountability and dependability. At L&N, we’re passionate about financial literacy. Our ultimate goal is to teach your child how to become a responsible saver. On the Sign Up screen you’ll enter your Username, Parent’s Email, Password and Zip Code. An authorization email will be sent to the Parent’s Email. This step must be completed or only 24 hours of gameplay will be allowed. On your first trip through each area of the website you will encounter numerous HELP screens and instructional videos. These screens and videos appear only during the first trip, but are available upon subsequent trips by clicking on the question mark icon in the upper right corner of each screen. Helpful information can also be accessed by clicking on the red icon above the heads of characters you encounter throughout the game. 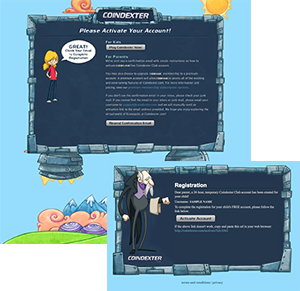 If problems occur during gameplay or while attempting to access the Coindexter.com website, please contact support@coindexter.com All inquiries will be addressed promptly by the Coindexter staff and they will gladly provide whatever assistance is necessary. Two new mobile apps are available for iPhone and Android devices. Help Farmer Franc with the harvest and learn to work smarter, not harder, with Professor Coindexter's genetically altered crops. Earn money walking the dog with Professor Coindexter's Thingamadog Robot. The farther you go - the more you earn! But be on your guard. As usual, Viktor Poluta's Polutatrons are out to stop you. 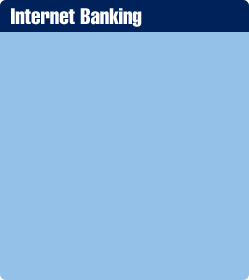 Login using your Coindexter Club account to tran sfer virtual funds to your Coindexter.com account.